Rimane aperta fino al prossimo 20 agosto la mostra allestita presso l'Haus der Kunst a Monaco (Germania) dedicata alla mirabil storia dell'etichetta Free Music Production (FMP), curata da Markus Müller sull'esempio di quella di cinque anni fa sull'ECM. A punteggiarne l'esperienza poche settimane fa, a quasi metà percorso, vi si sono tenuti due concerti d'eccezione, convocati da Peter Brötzmann: con lui c'erano Toshinori Kondo, Joe McPhee, Heather Leigh, Marino Pliakas, Alexander von Schlippenbach, Michael Wertmüller e Han Bennink. Dopo Monaco la mostra, dal titolo Free Music Production / FMP: The Living Music, riaprirà al pubblico a Berlino nel marzo 2018. 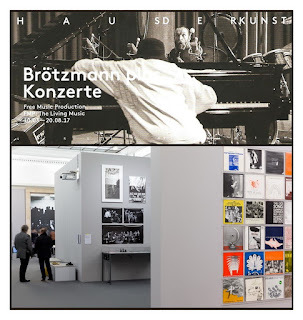 Haus der Kunst devotes an exhibition and concert series to the work of the pioneering Berlin avant-garde recording label and collective Free Music Production / FMP. Nearly 50 years after its founding, the work of this innovative experimental label and collective demands a new critical analysis with respect to its contributions to music. The exhibition and its accompanying program and publication follows on the curatorial context established with the landmark 2012 exhibition and concert series: "ECM: A Cultural Archaeology", which was devoted to the influential work of ECM and Manfred Eicher in 2012. The record label and improvisational music production platform Free Music Production / FMP was founded in West Berlin in 1968. Its radically expansive focus on contemporary improvisational music and avant-garde jazz was a global undertaking from the beginning. Cutting across diverse musical and cultural practices, FMP invited musicians and composers to explore a range of performance possibilities, from its renowned recordings to concerts, festivals (Total Music Meeting), interdisciplinary workshops (Workshop Freie Musik), and exhibitions. It involved hundreds of musicians, composers, and artists from around the world in a divided Berlin, at a time when the city was positioned as the beacon of Western artistic freedom. Working on the boundary between radical experimentation in sound structures and virtuosity in playing, FMP facilitated some of the most accomplished and important cultural achievements out of West Berlin in the postwar period. However, what the label, which functioned like a collective, achieved culturally and musically also extended into the political realm, especially as one of the first platforms to challenge the Cold War ideological system through its collaborations with East German musicians. With a catalogue of more than 500 published recordings, countless concerts, more than 100 festivals, and an archive of films, photographs, posters and other graphic work, FMP represents a wholly unique example of lasting artistic radicality that challenges previous norms of collective practice.